Fresh raspberries in an airy puff pastry sheet with decadent sugary raspberry cream! Made with Jus-Rol puff pastry sheet this is a winner at your dinner table! Jus-Rol’s ready rolled Puff Pastry Sheet is perfect for tasty dinners and desserts. To make the pastry cream, heat the milk in a saucepan until just before boiling point. Add the egg yolks, vanilla, sugar, cornflour and flour to a bowl and whisk for 1 minute before slowly pouring the hot milk over the egg mixture, whisking all the time. Pour back into the saucepan. Place back on a medium heat and allow the mixture to thicken, stirring all the time. As soon as the mixture has thickened, remove from the heat immediately, continuing to whisk to ensure the custard is smooth. Transfer to a bowl, cover the surface of the custard with cling film and set aside to cool. Once cool, transfer to the fridge to cool completely (this stage can be done the day before). Unroll the pastry sheet and cut into 3 widthways. Transfer to a lined baking tray and bake for 10 minutes. Reduce the temperature to 180C (160C fan) Gas 5 and continue cooking for 12-15 minutes, until the pastry is risen and lightly golden. Carefully transfer to a cooling rack and allow to cool completely. Heat the jam in the microwave for 10-15 seconds, add a little boiling water (1 tsp) and then strain. Allow to cool completely before transferring to a piping bag. When you are ready to assemble the mille feuille, carefully fold the pastry cream through the whipped cream and set aside. Slice the top off each piece of pastry and discard, turn the pieces over so the smooth side is on top. 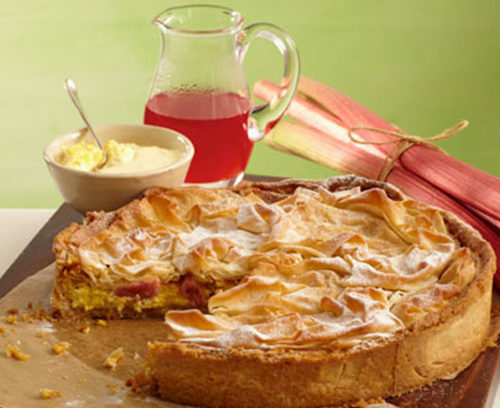 Place a piece of pastry on a serving plate, top with ½ of the cream mixture and ½ of the raspberries, then repeat. Finally top with the 3rd piece of pastry. Blend the icing sugar with a little water so you have a very thick icing that will sit on the pastry lid without running over the sides. Pipe lines across the width of the pastry, approximately 2cm apart, then use a cocktail stick to carefully drag down the length of the Mille Feuille, approximately 2cm apart, to create a pattern. Take the pastry out of the fridge and remove from the packaging approximately 10 minutes before you are ready to use it, as it will be easier to work with. For a tasty, time saving alternative, buy good quality lemon curd and stir 2-3 tablespoons through 150ml whipped cream! If your icing skills aren’t up to scratch, simply dust with a generous amount of icing sugar!